My grandfather, Robert Gordon Martin, served in Darwin during WWII. He never spoke of this experience. Our only real evidence of it was his blindness, which had been induced in old age by his smoking (they gave out free cigarettes during the war). My grandmother, Mary Jean Martin, also served, although in wireless communications and not, as I thought, by delivering bomb-filled cigars to the front line of Germans on horseback. Ron Middleton, dead at the age of 26, was posthumously awarded the Victoria Cross for action in a raid on Turin, Italy. I think Poppy’s exposure to the war, and his profound reticence about the experience, has fuelled my fascination with the way humans act when exposed to this very particular form of adversity. It not only exposes our predilection for mutual suffering and barbaric cruelty but it also shines a light on our nobility and the pure selflessness of bravery. For a long time I have been trawling the War Memorial website, reading the stories of those soldiers who were awarded for their exceptional courage, and this morning I came across Ron Middleton, who was born a year after my grandfather and died in 1942, at the age of 26. This account has been taken from the War Memorial Victoria Cross Encyclopedia. On 28 November 1942 he took off on his 29th operation (one short of the thirty required for completion of a ‘tour’ and mandatory rotation off combat operation) to the Fiat works in Turin, Italy. Middleton’s aircraft was struck by flak over the target, one shell exploded in the cockpit wounding Middleton in the face and destroying his right eye. The same shell also wounded the second pilot and wireless operator. Middleton lost consciousness and the aircraft dived to just 800 feet before the second pilot brought it under control. They were hit by more flak as they tried to escape the target. When Middleton regained consciousness he began the long and gruelling flight back over the Alps towards England, knowing that his damaged aircraft had insufficient fuel to complete the journey. The crew discussed the possibility of abandoning the aircraft or trying to land in northern France but Middleton decided to head for England where his crew would have the chance to bail out. During the return flight he frequently said over the intercom “I’ll make the English Coast. I’ll get you home”. As they approached the French coast the Stirling was again hit by flak but flew on. Now over the English coast with only five minutes of fuel left Middleton ordered the crew to abandon the aircraft. Five men left the stricken plane, and two remained on board to help Middleton before attempting to parachute to safety, although unfortunately both were drowned. The Stirling then crashed into the sea, killing Middleton. He was only one operation away from completing his first tour on bombers. Middleton’s bravery was recorded in the English press and earned him the admiration of the British public and a posthumous Victoria Cross. His body washed ashore at Dover on 1 February 1943 and he was buried in the churchyard of St. John’s, Beck’s Row, Suffolk, with full military honours. 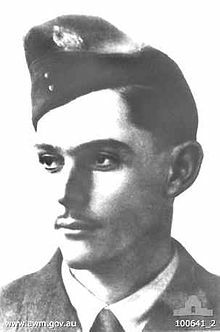 The last line of his Victoria Cross Citation reads: “His devotion to duty in the face of overwhelming odds is unsurpassed in the annals of the Royal Air Force”.